Earlier this month, Mission Local wrote about the “Jhec of All Trades,” a little-visited variety-store-turned-coffee-shop-that-didn’t-sell-any-coffee-turned-alleged-illegal-gambling-den — one of numerous gambling dens operating in plain sight in the Excelsior, Mission, Bayview and Chinatown. On Tuesday, Oct. 17, the purported gambling den came up snake eyes. In a daylong operation, San Francisco police officers executed a raid — the second one here since November of last year. An undercover officer or officers within allegedly spent a good deal of time documenting that the spinning fruits on the computer screens weren’t a mere video game, but a gambling operation, complete with payouts. They also videotaped the proceedings. Then, at his signal, a platoon of officers stormed the place. A raid initiated in late morning stretched throughout the day. 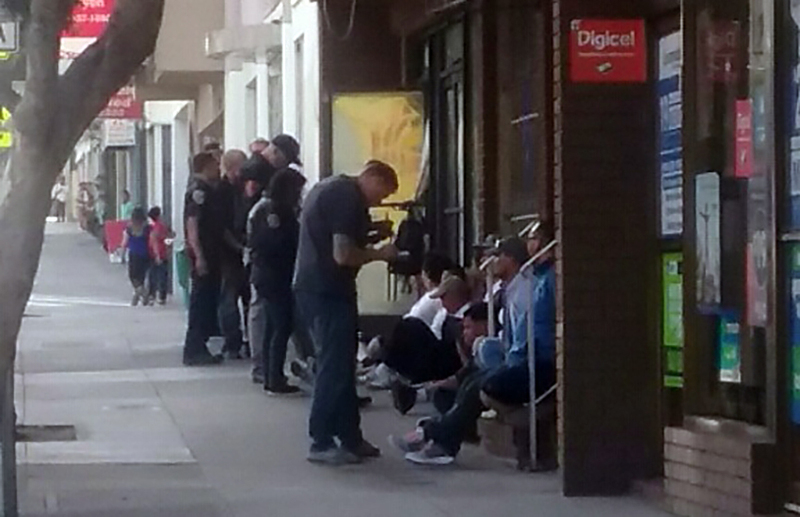 At 4 p.m., a line of handcuffed men were still seated outside 4182 and 4182B Mission Street as cops scurried about. At 6 p.m., police were still poking through the establishment. By around 8 p.m., after the police had apparently left the scene, men outfitted in shorts and baseball caps were sifting through the detritus scattered about in the hallway and amid the knocked-over chairs within, and stuffing odds and ends into garbage bags. McFadden is, evidently, none too pleased that the DA dismissed all charges pending further investigation following a Nov. 29 raid. That sweep led to nine men and women being cited or arrested, and thousands of dollars in cash being seized, along with gambling machines and material the police claim is methamphetamine. Five arrests were made during Tuesday’s raid. In addition to gambling equipment, money and drugs, police made off with financial papers, schedules, money orders, a money counter, a money dispenser and property receipts. Earlier this week, police arrested two men they believe to be connected to the Jhec of All Trades in a motorhome that’s often parked nearby, seizing “a large quantity” of suspected meth. 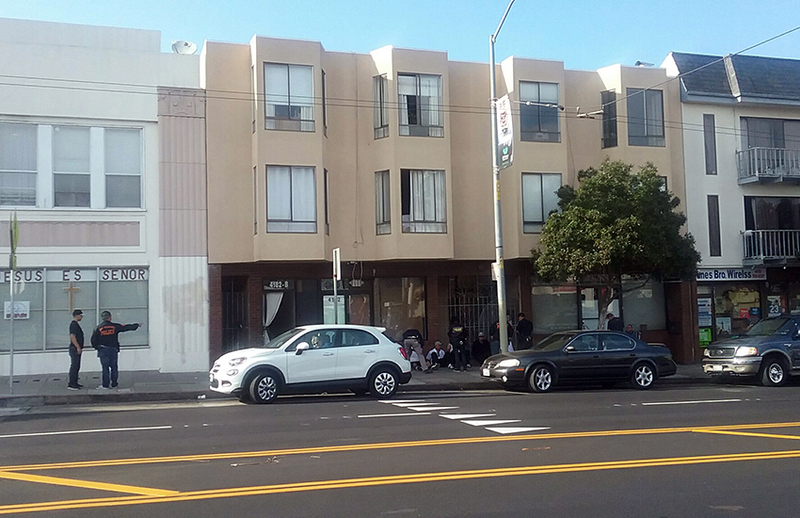 Gambling dens have, for years, been an eyesore in San Francisco’s outer neighborhoods — especially the Excelsior , where vacant storefronts are common and absentee landlords are happy to pocket rent money and look the other way. Along with potential criminal charges filed by the District Attorney against the accused casino’s operators and managers, McFadden hopes the City Attorney will move forward with a civil case against the building owner. It’s not the gambling in the casinos that gets them on the city’s radar, but the ancillary elements that attach themselves to gambling: drugs, booze, prostitution, fighting, noise and property crime. Proving a property is a “magnet for crime” is a key element of any nuisance case brought by the city. And that, too, becomes easier with a history of police raids on the premises uncovering illegal substances and activities. McFadden says he has, for months, been receiving complaints from the neighbors and neighborhood organizations housed near the Jhec of All Trades. Always he’s told them he was aware of the situation and to be patient. Now he says this is what he was building up to, and that we should expect “activity” on a few other places in the coming weeks. Capt. Joseph McFadden will speak at a community meeting regarding Tuesday’s raid at the Excelsior branch library at 7 p.m. tonight, Wednesday, Oct. 18. A big thank you to everyone in the community who has been working on this and related issues and a big thank you to Captain McFadden and the crew from Ingleside Station. Now, we will see what the DA does. His credibility is at stake. Good job SFPD. Congratulations neighboors for keep complaining about this scourge. This is just a battle won. These crooks, I am sure will try to open this $&it hole one more time. Neighboors please keep vigilant and report any suspicious activity. God bless you all. Than you Mission Local for reporting about this gambling/brothel den. I am sure you helped the neighborhood by reporting about it. SFPD probably felt motivated to do something after the news came out. Good job in helping to bring down this scourge. Please District Attorney, don’t let this gambling/brothel reopen again. Take some action against this criminals. Thank you all who worked in the raid of this averno. The neighborhood really appreciates this.